Can you believe it? A 4x increase in donations and a 7x increase in matching donations! Create a strong message – Clear, consistent message (across channels and social platforms) that people care about: “Give to the Max. Impact a child’s life forever” (see below). 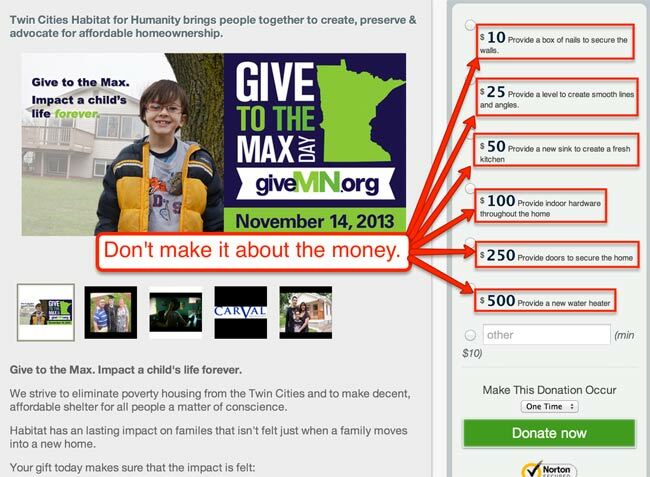 Make it easy to share – We had a shareable video about this impact, with links embedded to take viewers to our GiveMn page. During the week, we directed every visitor to our website to our GiveMn page to schedule or make a gift. Start early – Started promoting the day earlier than ever: the first week in October. Got over 100 people signed up to get a reminder email. Schedule gifts – Actively promoted the Give to the Max Day scheduled giving option, achieving over $80,000 in scheduled gifts going into GTMD. Leverage matches – Recruited a major donor to set a matching gift of $75,000. Leverage friend networks – Promoted their peer-to-peer campaign, “Habitat Builders” (individual fundraisers), who created their own pages off the main Twin Cities Habitat page and raised funds from their personal networks. Habitat Builders raised over $50k. Stay on top – All of these strategies enabled them to stay on the Razoo Leaderboard the entire day of GTMD13. This visibility created even more exposure for the campaign during GTMD13. I’ll add that they took GTMD13 seriously. Brian and his team (along with JD and me pitching in from Socialbrite) planned months in advance. During 2012, they also made a serious effort to improve their website and use social channels more strategically. If you’re considering a giving day in 2014, make a point of exploring how TCHabitat used Facebook, Twitter and Pinterest to get their community amped up!